Rénové en octobre 2018! Nouvelles photos postées. Réductions de la saison de ski !!! Nous n'avons jamais été aussi enthousiastes à l'idée de partager notre maison. Nous avons complètement rénové et réaménagé en octobre 2018! Maison confortable conçue pour les grandes familles et les grands groupes. Nous proposons 6 salles de bains, 8 chambres, 2 cuisines entièrement équipées / meublées et 2 espaces de vie. 2 cuisines, 2 salons, 4 chambres principales, 2 chambres pour adultes supplémentaires, 2 chambres enfants avec 2 lits superposés et un lit gigogne. 2 garages massifs. Deux des chambres sont conçues spécifiquement pour les enfants avec des couchettes et des lits gigognes avec des lits pleine grandeur sur le fond. Parfait pour les enfants mais pas très bien aménagé pour les adolescents et / ou les adultes. Situé dans la meilleure zone de Pagosa Springs et ses environs. Profitez d'un quartier calme sur le flanc de la montagne, le plus proche du domaine skiable de Wolf Creek. Notre quartier entoure la rivière San Juan! 4 Master chambre / salle de bains 2 salles de bains et demie avec WC et lavabo. S'il vous plaît demander au propriétaire à propos de Stand Up Paddleboard Location de et l'accès à un véhicule. Epic Snow Week for a Bachelor Celebration! Great for 2 families! Close to slopes! Our family of 20 stayed here for 6 days during a ski vacation and had a fantastic time! The house is on the east side of town about 6 minutes from downtown Pagosa Springs (where the hot springs are-A MUST!) and about 15-20 minutes from the Wolf Creek Ski Area. It's hard to imagine the layout of the house through the pictures so I'll try to explain it. There are actually 2 separate living areas, like 2 condos put together. When you walk in the main entrance you can go left upstairs to one living area (2 bedrooms, 2 bath, kitchen, living area) or go straight, around the corner and upstairs to another living area (2 bedrooms, 2 bath, kitchen, living area). Now in the hallway, where you first walk in, there are 3 bunkbeds.There is also a bathroom and bedroom. Around the corner is another bathroom/bedroom and 4 bunkbeds. There are also 2 washers and 2 dryers. All on the first level. The bunk beds worked fine for us since they were for the kids and the bedrooms worked perfect for the number adults we had. The house has all amenities you could want or need. The kitchens were fully stocked so you didn't have to take anything from one to use in another. We had four automobiles and parking was not a problem. There was a nice yard for the kids to play in the snow. There is wifi, but we could never figure out how to get local channels. We mainly used Roku and Netflix. As great as this place is, there were a few cons. Lack of a central living area or kitchen. This layout may work perfect for 2 families but we were on a family vacation and were looking forward to eating together and hanging out together but we found ourselves divided between the two living spaces due to the small space of each and lack of seating. On the same note, there was not really a space for children for teens to hang out, but we knew that going into it. The upstairs got extremely warm even when we tried to close the vents or make adjustments. You'll need to space out your showers. A house this size will only allow 3, maybe 4 showers at a time. I'm not going to nitpick every little thing. This is a $600/night house, not a $1200/night house so don't expect luxury. Overall, we had a wonderful time. It housed our entire family and we made some great memories. The owners are very easy to contact and extremely pleasant to work with. I would recommend for the location and the price. The house was perfect for our family and friends of 19 people, and still had extra room. My family and 4 other families visited Pagosa Spring for Christmas. The house is super clean, and fits our party of 23 perfectly. 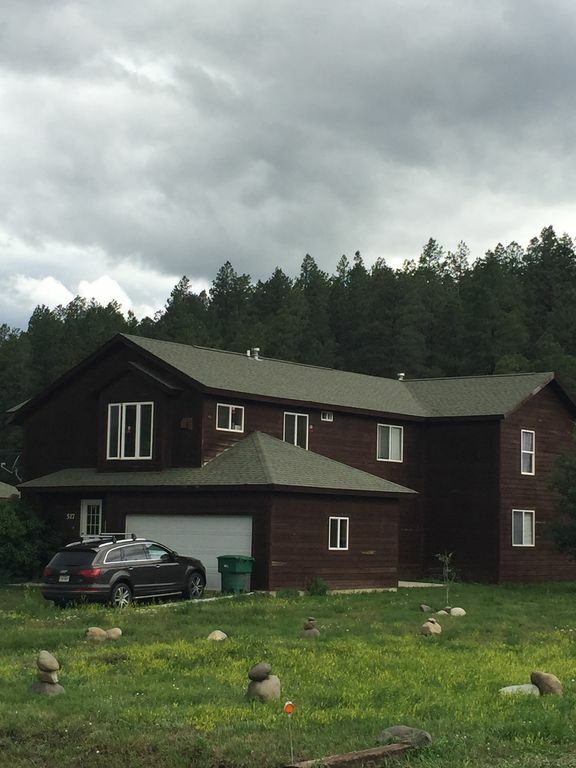 It is conveniently located off the road between the town and the ski resort. We found it super easy to go skiing or hot spring spa. The owner - Tim, is a very caring person. We lived in the house when a Winter Storm was approaching. He texted me a lot of tips to handle the situation, and offered to move his car out of the garage and let us to move our cars in. Even after we checked out, he followed up with us to make sure we safely passed the mountain road in NM. We had a little problem with the water heater, Tim and the maintenance guy is very responsive, and got it fixed even on Christmas eve. Thank you Tim, We will definitely come back to visit again. Not what was advertised. Not worth the money you pay. The property was not what was advertised. It was not clean. They’d advertise 8 bedrooms and there were 6 with beds just in halls for the other rooms. So no privacy in them. There was a door on one side but that just separated the two sides not give privacy to the hallway beds. when we got there and they had left only 6 towels for a 24 people group and only the toilet paper that was on the rolls. One of the refrigerators had stop working and the food that had been left in smelled so bad. So we had to clean it all out. It did start working finally and then froze the things we had put in the refrigerator. Some of the bunk beds made so much noise when you moved on them we couldn’t sleep on them. Some of the windows didn’t have screens so we couldn’t open the windows. The said there was a lawn and all there was were weeds. They did come and cut them after we said something. In spite of the conditions we did enjoy CO and had fun with our family. We do this every other year where we rent a place and we have never gotten a place this bad ever. For the money you spend it is not worth it at all. The owners need to go in and fix a lot of things and change their advertisement to what it really is. It’s very very misleading. But in spite of it all we did love CO. It’s beautiful. My home was not anything close to what this family was expecting. They requested the use of my home for 14 adults and 10 kids which my home would have fit comfortably but this group traveled with 26 full grown adults which clearly will NOT fit in my home. They embellished and even fabricated issues. They even threatened legal action multiple times. These folks had a rough trip because someone made a mistake by not reviewing my listing and misleading me about the # of travelers. Owner Response--- The person in the group that made the reservation did not read the description. There are clearly 8 bedrooms and 6 bathrooms. Owner Response--- It was clean. We have a property management company that makes the house ready before every guest and they do a fantastic job. Owner Response --- Delivered more towels the next morning. We also provided more TP the next morning. I sent maintenance to check and the fridge worked perfectly fine. The tossed condiments and other items that we usually leave behind for the next guests. Owner Response--- We had the lawn serviced the day after they checked in. We are under water restrictions so we can’t make the lawn look as nice as we’d like. The plants we let grow tall are not weeds, they’re plants that attract humming birds. The house was perfect! It was clean, comfortable and well stocked. The owner kept in touch throughout our stay and was amazing. Notre maison est sur le côté de montagne de Pagosa Springs, situé le plus proche de Wolf Creek. Please contact the owner for a formal quote. I offer multiple day discounts.